Good water management. 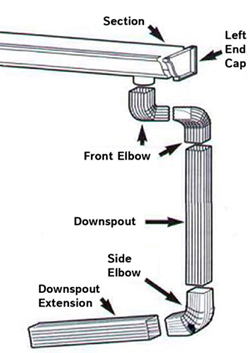 A well-designed, professionally installed gutter and downspout system provides protection against erosion, plant damage and costly basement flooding. Luckily, Metro Construction can keep you high and dry with quality gutter installation and examination. We hang gutters and install gutter coverings throughout Colorado, and we won't stop until you are completely satisfied with the outcome of your project. Don't get caught in the rain! Schedule a free estimate for the cost of a gutter installation in Aurora, Denver, Colorado Springs and areas nearby and keep your home safe from water damage. Metro Construction installs gutters gutters in Galvalume® coated steel or aluminum varieties. Each material provides a unique appearance and benefit, filling the needs of any application. When you add a covering to your gutter, water can still flow freely off your roof and into the downspouts while trapping leaves and other debris. You won’t have to scoop all that gunk out of the gutters each year and enjoy a more functional gutter system. Metro Construction installs gutter coverings when we hang new gutters on your home. All of our professional gutter contractors can handle the needs of your home, no matter how complex they might seem. Contact Metro Construction by calling 1-844-386-0476 or fill out the online form for a free inspection and cost estimate! We offer all our best gutter services in Aurora, Denver, Colorado Springs, Boulder, Littleton, Fort Collins, Arvada, Broomfield, Longmont, Pueblo and throughout the surrounding areas.